Lightweight, reflective vest for day or night features adjustable straps for one size fits most sizing and even offers a pocket for your cell phone. 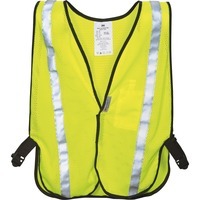 This HiViz yellow safety design is equipped with 1 3M Scotchlite reflective material. The breathable mesh design is ideal for recreational or light duty use. Outer fabric is 100 percent polyester.